The inaugural Cardplayer Poker Tour event at the Choctaw Casino in Oklahoma saw a fantastic turnout for the $1,000 buy-in Main Event, as 800 players registered for the tournament, including some of the biggest names in poker history like TJ Cloutier and Scotty Nguyen. With just one more day of play remaining, Cloutier is still in contention for the $150k first-place prize, as he sits in 9th place out of the remaining 20 players. The two starting flights for the WPT Merit Cyprus Main Event are in the books and a total 132 players have managed to move on to Day 2 of the event. The overall chip-leader is Chino Rheem, who bagged-up an impressive 291,500 chips, while his good friend Mike Mizrachi managed to end the day with just over 50,000 chips. A slew of talented players managed to make it through to Day 2, including Erik and Robert Mizrachi, Dominick Nitsche, Oleksii Kovachuk, Marvin Rettenmaier, Eric Cajelais, Toni Judet, and 2012 WSOP Main Event 10th place finisher Gaelle Baumann. The event attracted a total of 329 players, and will award a top-prize just north of $287k. 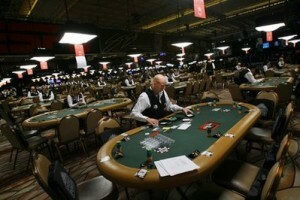 This entry was posted on Monday, August 6th, 2012 at 1:52 pm and is filed under Poker News. You can follow any responses to this entry through the RSS 2.0 feed. You can leave a response, or trackback from your own site.